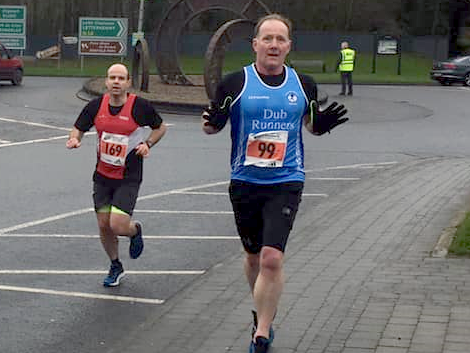 parkruns, Lifford, celebrations and more over the jump! That is where we leave it for another week. Personally, I want to say thanks to everyone who came along to Stranmillis on Saturday morning. That event will fast become a Dub favourite training run for some hill work – so don’t be a stranger at the college! Can I say a massive thank you to my neighbour for allowing me to barrow her large sheet if plastic covering – ta Pauline! 2 John Close 00:18:45 2nd Place! Newbie PB! 5 Steven Todd 00:19:15 Newbie PB! 8 Jim Larkin 00:19:34 Newbie PB! 13 James Sheridan 00:20:11 Newbie PB! 33 Niall McCrory 00:21:44 Newbie PB! 39 Peter Morrison 00:22:03 Newbie PB! 41 Ryan Love 00:22:13 Newbie PB! 60 Roisin Byrne 00:22:50 Newbie PB! 66 Alastair King 00:22:58 Newbie PB! 71 Richard Conn 00:23:11 Newbie PB! 72 Catherine Baillie 00:23:16 Newbie PB! 75 Peter Donnelly 00:23:21 Newbie PB! 76 Marie Sweet 00:23:23 Newbie PB! 77 Claire Tonry 00:23:25 Newbie PB! 102 Judith McManus 00:24:02 Newbie PB! 110 Maire McCaughey 00:24:24 Newbie PB! 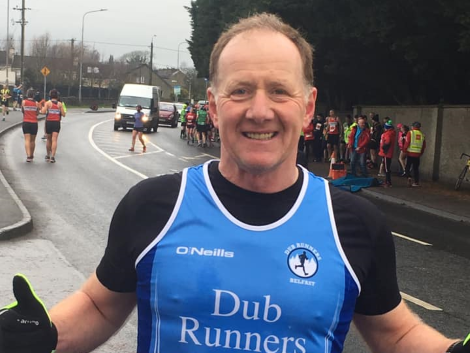 119 Ronan McCaughey 00:24:38 Newbie PB! 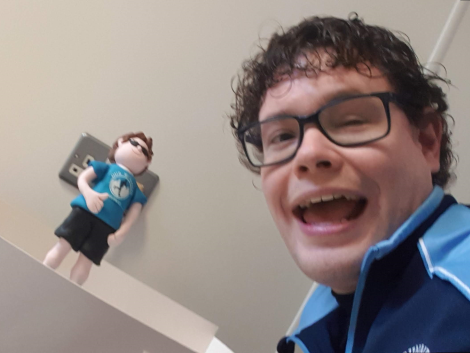 128 Dermot Dawson 00:24:54 Newbie PB! 138 Edward Caldwell 00:25:18 Newbie PB! 140 Karen Carlisle 00:25:21 Newbie PB! 141 Stephen Irvine 00:25:23 Newbie PB! 148 Marcella Cassidy 00:25:31 Newbie PB! 149 Ronan O'Flaherty 00:25:32 250th parkrun! Newbie PB! 161 Liam Lavery 00:26:01 Newbie PB! 167 Frances McCambridge 00:26:38 Newbie PB! 186 Kathy Mayhew 00:27:06 Newbie PB! 187 Brian Derby 00:27:08 Newbie PB! 188 Michael Kirk-Smith 00:27:09 Newbie PB! 197 Danielle McCluskey 00:27:24 Newbie PB! 212 Anne Marie Ryan 00:28:02 Newbie PB! 260 Brona Shaw 00:30:59 Newbie PB! 297 Jane Patterson 00:34:40 Newbie PB! parkruns are all about having fun and enjoying running. Two things Dubs are very good at. 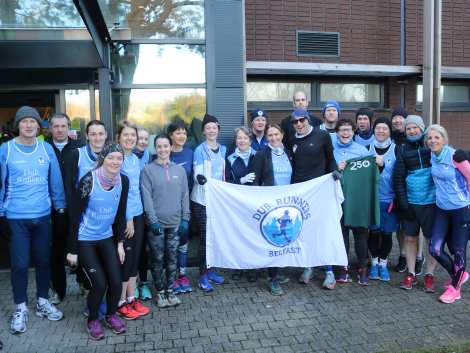 This was the first run of the Stranmillis College parkrun and chock full of anniversaries – Ronan’s 250th and Roisin’s 200th – huge numbers, it was set to be a very special day. We had more than an Errigle of dubs, if that is even possible?! Newbie Pbs all round and another podium finish to boot! Below is a selection of photos we have a full gallery from the event online right here. parklife: Most of the 32 Dub Runners who made it on Saturday! 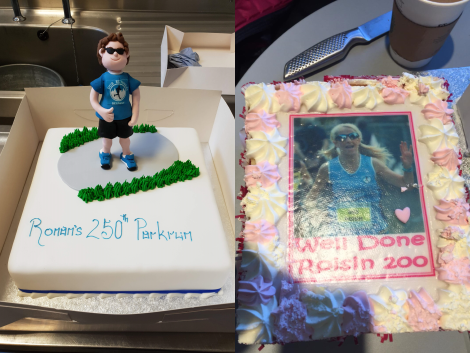 parklife: Celebrations for Roisin (200th) and Ronan (250th)! parklife: A feast of cake for everyone! One is a caricature of a human, the other is a lump of icing! Don’t forget our next Flashmob parkrun will be on Saturday 16th February at Victoria Park where we’ll be celebrating our latest entrant to the green t-shirt 250 club – Kathy! Lifford: At last! In the final race of the series - we get a photo of Paul! Lifford: Same pose as when he was running...!!! Where one park had 32 Dubs, there was always going to be one who slipped through the net. 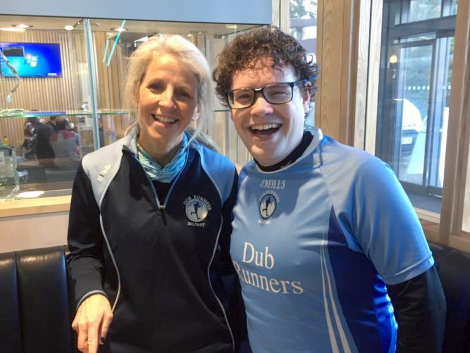 This week, Ormeau was the beneficiary of our lone blue top – who went for a quick jog down the road. Shall we see who missed out on two cakes?! Natalie CONNOLLY 00:21:49 2nd Place! Nice running Natalie – especially when one in five events where were cancelled due to the icy and frosty morning. Although for us in Belfast it was a lovely morning with the sun breaking through mid-run! Leave your hat in the drawer for another week (never had the chance to say that before!!) Embarrassingly for us here in the Towers, we couldn’t even find a photo from the event!